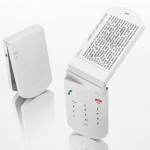 The Onyx; this was the model mobile phone which took the more traditional keypad to a whole new level by introducing the touch screen edge. With just a finger or a joystick you could click your way to revelation. But even with the pomp and color that Synaptics and Pilotfish, who are interface developers and industrial studio designers respectively, launched Onyx, it still wasn’t good enough to get sold. 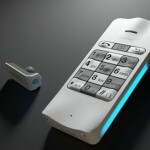 But it may have become the harbinger of future mobile phone concept developments. With Pilotfish, a new development in the concept of phone music editing was born. The Ondo combines the touch screen ability with a back that lithely twists and turns to allow for fast and comprehensive editing of desired music on the phone. 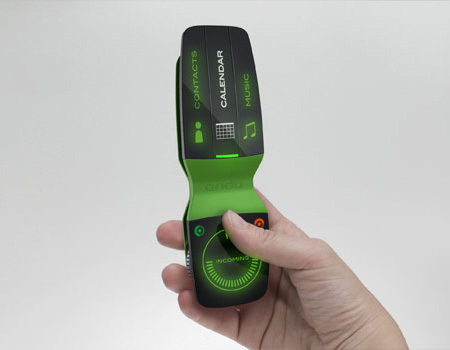 This new concept according to Pilotfish is a bid to lessen the burden of mobile phone manipulation especially for those who find it hard to even understand the features and also make music enthusiasts happy. 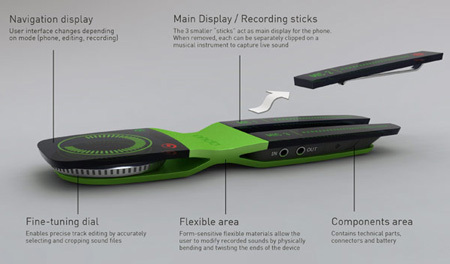 Of course we can not conclusively judge the efficiency of this designed concept but the need for a classy easy to use music editor has always been in the heart of mobile phone music lovers who want a calling phone with an Ipod like concept among its features. 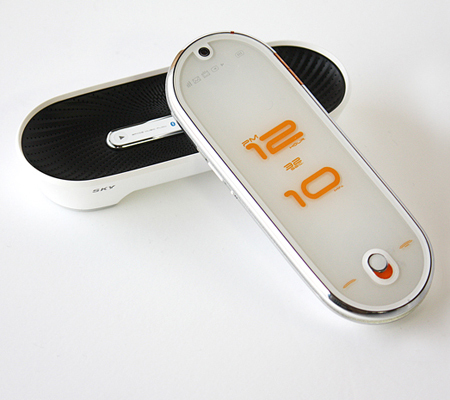 MUNICH, Germany – April 20, 2009 — Pilotfish, a progressive industrial design and product development studio based in Munich, Amsterdam and Taipei, today introduced Ondo, a dedicated music editing phone concept. 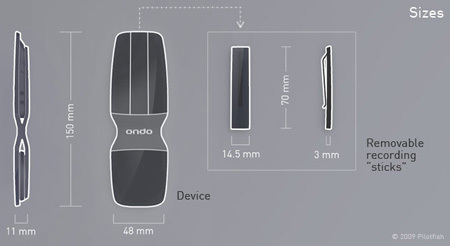 The Ondo concept enables OEMs to visualize a new form of user interaction for mobile phones. User The target user for “Ondo” is the music enthusiast who seeks to interactively capture and edit sounds. Going beyond software-based solutions of other products, it is specifically designed to effectively collect pure sounds and is specially constructed to create a tactile sound editing experience. 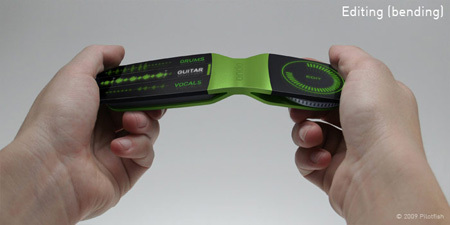 Made from form-sensitive flexible materials, “Ondo” allows the user to modify recorded sounds by physically twisting and bending the device. 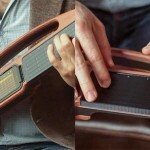 Like a guitarist pulling on a whammy bar, users can feel and hear the musical effects as they create them. Another innovative feature of “Ondo” are the three removable display ”sticks”. 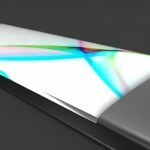 In their normal state, the “sticks” act as a unified touch display for the mobile device. 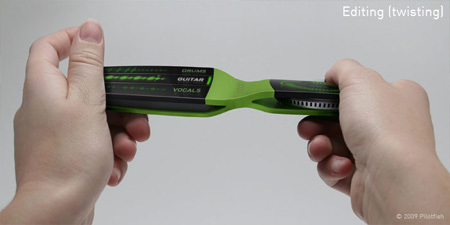 When removed, each can be separately clipped onto a musical instrument or person to capture live sound. Like a portable recording studio, “Ondo” makes mixing tracks easy, because each “stick” picks up isolated sounds from each individual instrument. 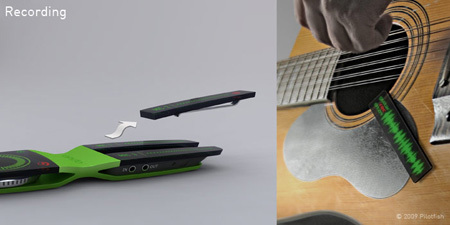 The recordings can be immediately sent via MMS (Multimedia Messaging) around the globe allowing musicians at different geographical locations to jam together. In party mode, “Ondo” works as a digital mixer enabling the user to create seamless transitions between songs. 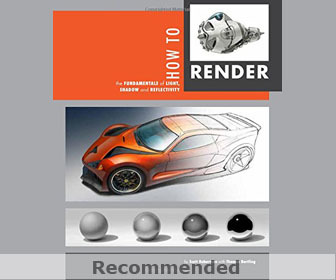 This is made easy with interactive touch functions combined with integrated software support. The advantage of such a device is that a range of services and accessories can accompany it in order to enhance the sound capturing and editing experience. 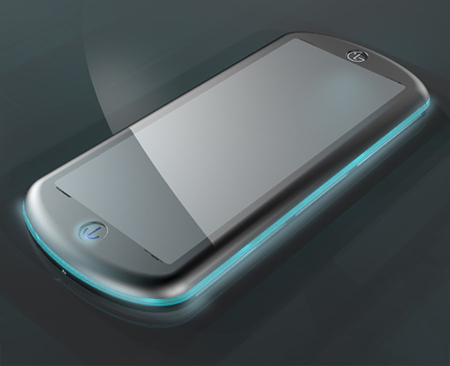 From a business perspective, most of the players in the mobile world can benefit: for example, content creators – by providing sound libraries or musical games for download; operators – by facilitating increased user interaction; and device manufacturers – by producing accessories such as input devices, Bluetooth instruments, etc. Tagged as munich germany, music editing, music enthusiasts, pilotfish, studio designers, target user. I dig it. Good research. 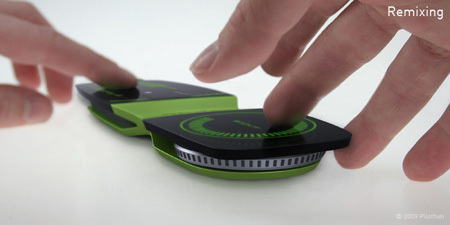 Concept reminds me of the toy Bop-it!